Tōkyō: Hayakawa Publishing INC, 1990. 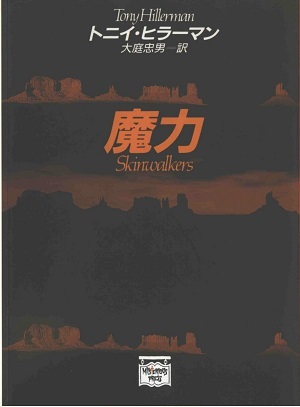 This is the first Japanese paperback version of Skinwalkers. This edition was published in 1990 by Hayakawa Publishing INC in Tōkyō, Japan. This edition is also associated with the Mysterious Press, which is a trademark of Warner Brothers, INC. was used by Hayakawa Publishing, INC. with permission. Tony Hillerman's original English text was translated into Japanese by Tadao Oba. The cover design features the repeated image of a southwestern skyline. Binding: Two-tone gray paper covers printed in black and white. The publisher's logo, title, author, and publisher are printed vertically on the spine.